I looked in the mirror and didn’t recognize the face staring back at me. Who was she? How did she get there? She was a mere skeleton of her former self. It seemed like one day I was alive and thriving, working and contributing to my family and society. Then almost overnight I was bed-ridden, being kept alive on IV-hydration and nutrition, having gone from a petite 113 pounds to a skeletal 74 pounds and weaker than I’d ever felt in my life. That illness led to the most debilitating depression that stole my joy, killed my peace, and threatened to destroy my identity. It’s just what the enemy does. It left me feeling worthless. Helpless. Hopeless. That morning as I remained home, alone, and in bed, it was cloudy outside just like my spirits. 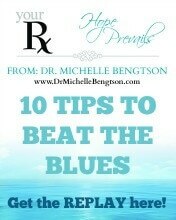 In the depths of my soul I was so lonely I could hardly stand it—being ill and in that bedroom for weeks didn’t help. I felt so isolated, so lonely, so afraid that was all my life would ever be. Who was I if I could no longer work, no longer care for my family? All I could do was sleep. I had no appetite. I had no energy, and no desire to do any of the things I’d always loved to do. What about the “Joy of my salvation?” Where was that? Maybe I was just joy-immune. I knew what I was supposed to do. I’d counseled patients for years who struggled with depression, and I tried all the same things I had suggested to them: I’d gone to therapy and done the work. I paid attention to sleep, diet, and exercise. I tried medication. They all helped but they weren’t enough. Something was missing. When we don’t address the spiritual component of #depression, we put a bandaid on it. Slowly over time God revealed the missing piece: If we don’t address the spiritual component of depression, we’re really just putting a bandaid on it. As I began to see the enemy’s scheme and come against him with the authority given to us as children of the Most High God, I began to experience the dark cloud lifting. 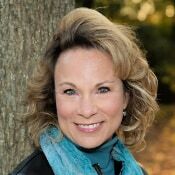 The hard work of healing required that I “take every thought captive.” Essentially, that meant I had to be aware of the thoughts I was having and check to see if they agreed with the truth of Scripture. If they didn’t, I needed to reject them, and replace them with God’s truth. As I began to come against the enemy’s lies with the truth of God’s Word, the darkness was replaced with light. 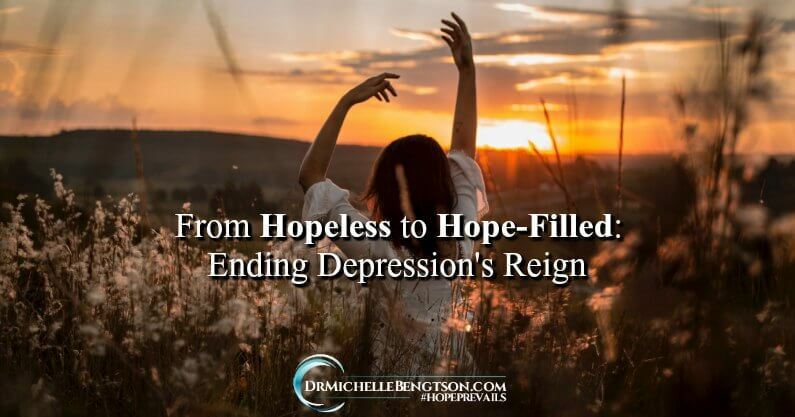 Victory over depression begins with renewing our mind and discrediting the enemy’s lies. That’s the secret of moving from hopeless to hope-filled. What lies have you believed that need to be uprooted with God’s truth today? By 2020, depression is going to be the greatest epidemic worldwide. Every year one in ten adults is diagnosed, and at some point in their lifetime, one in four people will be diagnosed with this dark condition. 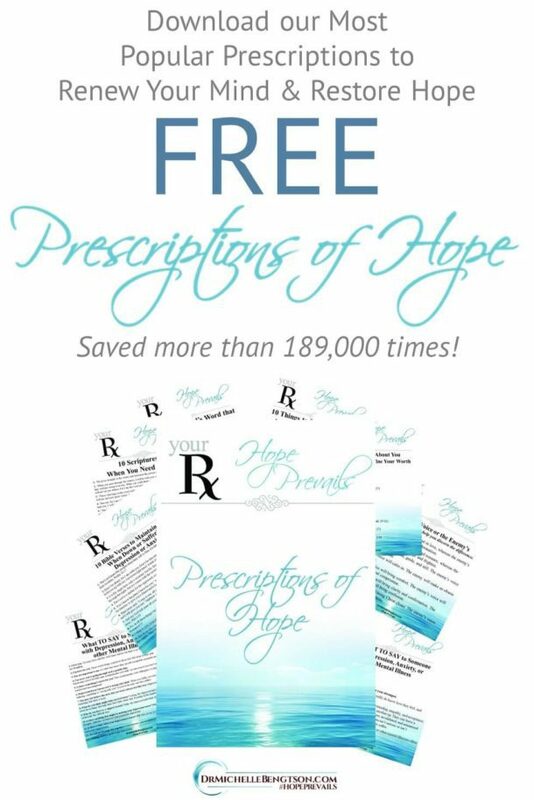 If you found this post encouraging or educating, would you please be an Ambassador of Hope and consider sharing it so that others would find help and hope as well? 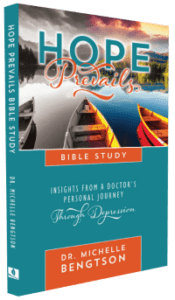 The Hope Prevails Bible study is now available! 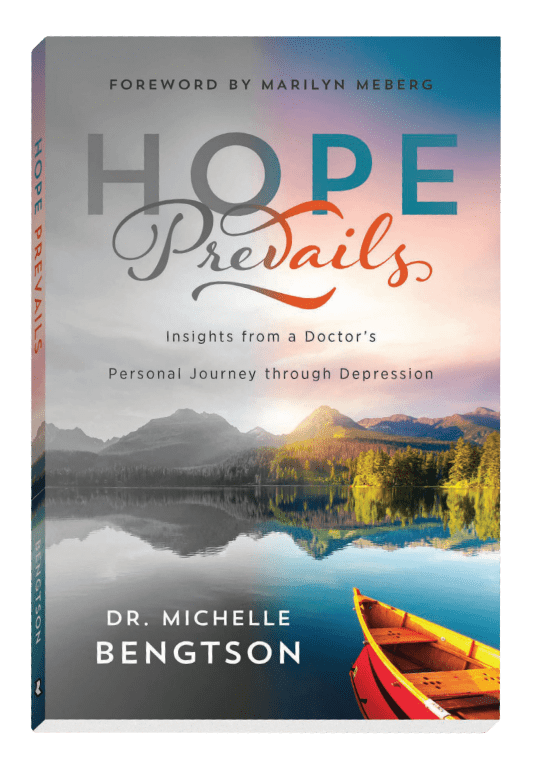 #HopePrevailsBibleStudy: #hope, help and healing from #depression. 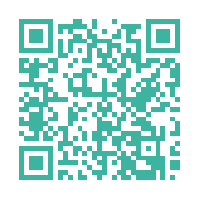 Are you or is someone you love experiencing depression? 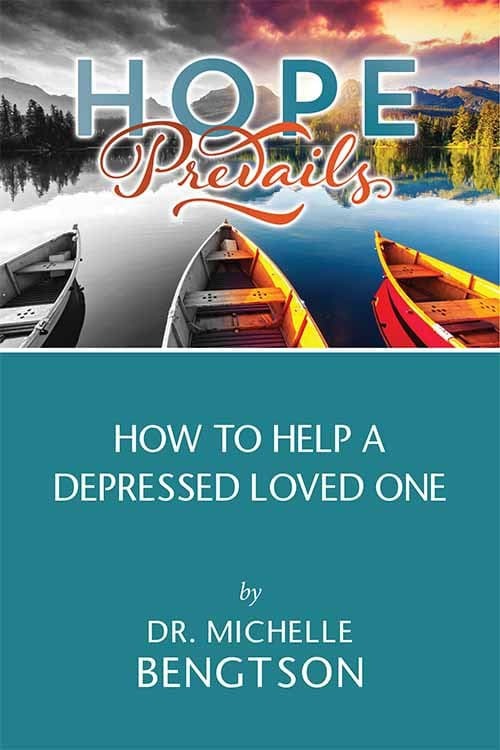 This book offers tangible help, hope, and healing from someone who’s been there and has come out on the other side. Michelle, thank you so much for these verses of victory. I always love being your neighbor at the link-ups and almost always the timing is just perfect for me and addresses something I need for that day. Today is no exception. I truly appreciate the time you take to share these truths from Scripture. It’s such a blessing to me! This is such a valuable post. I have pinned it for future reference. Thank you so much for sharing part of your story! The devil is a joy thief and killer. I’ve discovered that even in trying to help others,they can be determined that you are wrong,and that takes away your joy but there are those who will listen. I am so glad you overcame because He did, you bless so many people. 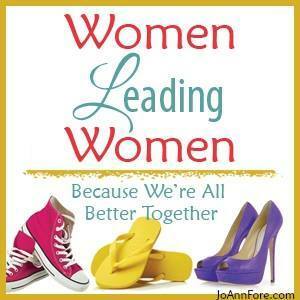 There is so much wonderful truth in this post! I too have suffered form depression on and off for many years and the cycle is hard to break. I love that along with your clinical expertise you have included faith. May God bless you and restore the joy of salvation to everyone suffering with depression today! Too often modern medicines and therapies only address the physical component of illness without addressing the fact that we are a unified creation of body, soul and spirit and true health requires that we address all parts. So glad you discovered that and shared your story. Love all the truths of Scripture that you shared! In everyday conversation I have so many Christian people tell me they are struggling with depression. And this teaching is so needed! I know that through my own mental battles the powerful words of Scripture have proven to be true as I take every though captive! 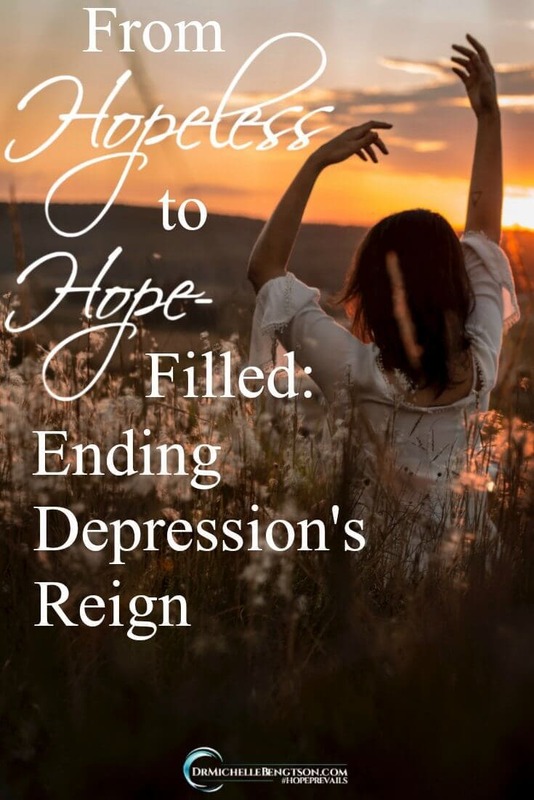 Thanks for sharing hope that depression is not a dead end, and it need not be the focus of our story because of the power of God and the hope of the gospel. Always good to be your neighbor…visiting from Mom-gene. Shared on social media!